Backboned by a highly skilled, professional and experienced team of five employees, AD Test Centre is quickly developing an enviable reputation as a quality test centre with affordable prices. 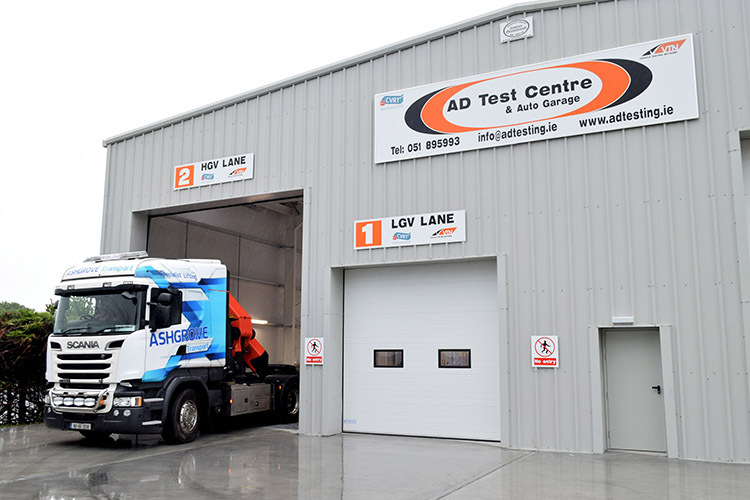 AD Test Centre, located in Rathkiernan, Mooncoin, Co. Kilkenny, opened in July 2016. Combining significant business and technical experience, Eoin Doyle and Benny Aylward of AD Test Centre Ltd offer a turnkey solution to statutory commercial vehicle testing and repair work (VTN/ CVRT Testing). The Commercial Vehicle Roadworthiness Test (CVRT) is a roadworthiness test for all commercial vehicles, buses with more than eight passenger seats and ambulances, all over one year old. The CVRT confirms that a vehicle satisfies basic safety standards on the day the test is carried out. Specialising in both heavy and light commercial vehicle testing, AD Test Centre guarantee a prompt and professional service. In order to provide their customers with the utmost flexibility AD Test Centre offer services such as vehicle collection, return and on-site repair services for any routine and/or unscheduled maintenance required. On top of being a fully approved CVRT Centre, AD Test Centre is also home to Suir Auto Garage which offers both private and commercial vehicle servicing and repairs. They completed their first test on June 29th last year and it’s fair to say that they have hit the ground running as they have been very busy since opening their doors. One of AD Test Centre’s main objectives is to build up a loyal customer base and they have begun to make inroads on that. Only a couple of months into their second year in operation, already they are seeing the returns of repeat business and it is quickly becoming apparent that customers are coming back to them to cater for their testing needs. Open Monday to Friday (7am to 6.30pm) and Saturday (8am to 5pm), AD Test Centre offers a variety of services, all at competitive prices. They believe in taking good care of their customers and believe in building long lasting and trustworthy relationships. The services they offer within their state-of-the art facility include includes CVRT testing and certification (light and heavy commercial vehicles), commercial trailer testing, tachograph calibration, speedlimiter seals and plating. In addition, they can satisfy all your requirements when it comes to new tyres, engine oil, batteries, brake fluid, brake pads etc while they also provide a vehicle collection and return and replacement vehicle (subject to availability) service. They also offer both private and commercial vehicle repair and servicing. Their team works out of an ultra-modern, purpose built facility which houses two lanes, one each for LCVs and HCVs, as well as an office and front desk reception area. AD Test Centre prides itself on offering a very professional service and a quick turnaround on all jobs. If anything extra is needed they’ll give every job that extra bit of time and fit it in with the test. It is very much a case of so far, so good for all involved with AD Test Centre and there is plenty of scope for expansion as the fledgling operation turn its attention to the future. The hope is to build the business further as they are not up to capacity yet. Having recently recruited a third tester in order to enable them to provide a more efficient service to customers will also allow them to grow the business further in the coming year. Commercial Vehicle Roadworthiness Testing (CVRT) is part of the RSA’s effort to keep Irish roads safe. The CVRT confirms that a vehicle satisfies basic safety standards on the day the test is carried out. It tests what is accessible and visible and all commercial vehicles must be tested when they are over one year old and annually after that. Yearly tests and well-maintained vehicles mean fewer breakdowns. The CVRT programme improves the overall efficiency for goods and passenger vehicle testing. ​​To book your vehicle’s CVRT Test or to find out more about the professional services available at Kilkenny's newest and most advanced vehicle test centre and repair garage, give them call or send them an email. 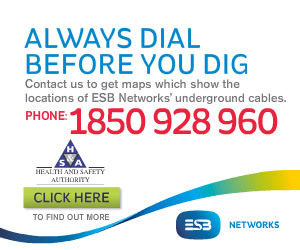 AD Test Centre take your safety seriously.